Other Common Names: Often further classified as to port of shipment or country of origin; consignments to U.S. trade mostly K. ivorensis. Munyama (Uganda), Acajou d'Afrique (Ivory Coast), Dubini, Dukuma fufu (Ghana), Ogwango (Nigeria). 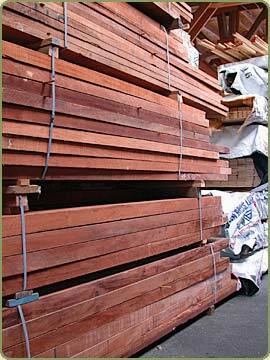 Description: Heartwood Reddish, pinkish, salmon colored, or yellowish when fresh cut; deepening with age to deep rich red or brown; distinct from the yellowish or whitish sapwood. Luster high and golden; texture rather fine to coarse; straight grain to roey, wavy or curly, ribbon grain, often with an attractive figure. Mechanical Properties: Janka Side Hardness 740 lb for green material and 800 lb for dry. The wood can be air-seasoned and kiln dried easily without appreciable warping or checking. Shrinkage green to ovendry: radial 3.0%; tangential 4.1%; volumetric 7.8%. Movement after manufacture is rated as small. Working Properties: Very easy to work with hand and machine tools, torn and chipped grain is common with figured material. Easy to finish and takes an excellent polish. Slices and cuts into fine veneer. Durability: Generally heartwood rates as durable in resistance to a brown-rot and a white-rot fungus. Moderately resistant to dry-wood termites and little resistance to attack by marine boreres. Uses: Fine Furniture and cabinetmaking, interior trim, paneling, fancy veneers, musical instruments, boat building, pattern making, turnery, and carving. Description: Santos Mahogany is reddish brown changing to a deep red or somewhat purplish after milling. Working Properties: It is reported to be moderately difficult to work but can be finished smoothly with a high natural polish. Though non siliceous, there is more than the usual dulling of cutters. Clear Grain - This wavy clear grain has lots of character. This African hardwood is highly sought afterr for its similarity to Mahogany for guitar making, furnitue making and now for flooring, decking and paneling applications. Sapele's colors are a little more reddish than Mahogany, with dark tones and purple-brown hues. It works well with hand and machine tools, but its interlocking grain can tear easily in planners if not done carefully. Sawing and peeling this wood is easy, unlike other hardwwoods that can put a strain o your tools. Sapele Flooring, custom milled siding and trim boards are among the products Bear Creek Lumber can provide you in this exotic hardwood. We have in inventory at any given time of 4/4 and 8/4 slabs for you to purchase and work on, or for us to mill to your specifications. Call us today to find out more. Clear Grain - This is the top quality garde available. Above: Several rough cut slabs of mahogany ready to be shipped. Specific Gravity (oven dry): 0.61 lbs/cu.ft. Durability: Durable species, but not reesistant to marine borers. Workability: Good to work with in general, except for interlocked grains which is difficult to saw and plane.